Father Francis Groarke and a deacon pray over people attending a Charismatic healing Mass May 19 at St. Thomas the Apostle Parish, Glen Mills. 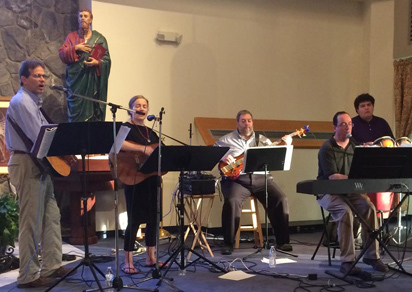 The band Spreading the Flame provides music during the Mass and healing service May 19 at St. Thomas the Apostle Church, Glen Mills. 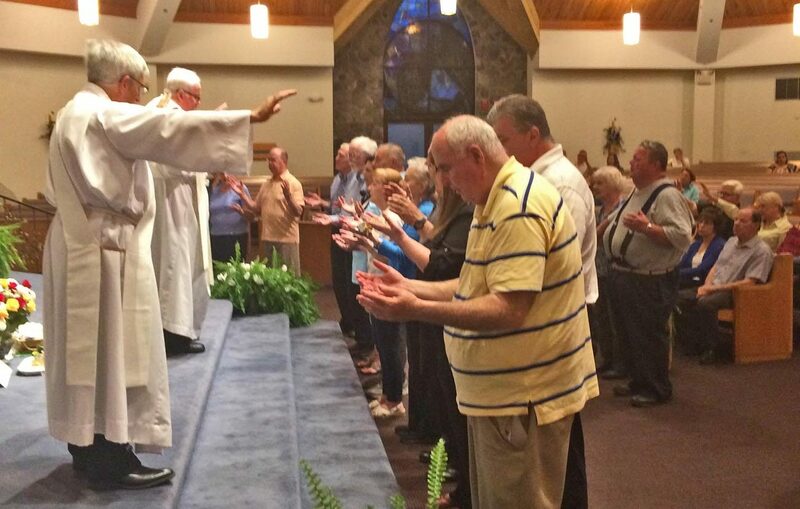 More than 100 faithful pilgrims gathered at St. Thomas the Apostle Church in Glen Mills on Friday, May 19 for a Charismatic Mass and Healing Service organized by the Delaware County Vicariate Prayer Communities. Parishioners of St. Thomas and people from other local parishes gathered to pray and fill the church with word and song. The evening included recitation of the rosary, worship music, the celebration of the liturgy and a time to receive healing through anointing with holy oil. Father Francis Groarke, pastor of St. Thomas and principal celebrant and homilist of the Mass, began by leading the congregation in the rosary before the Blessed Sacrament, a suitable way to start the evening. The monstrance was removed from the altar before the start of the Mass, which began with the hymn “Litany of the Saints.” Father Groarke saw that as an appropriate song because whenever an important event takes place in the church it calls upon the saints. “The saints behold the glory of God,” he said. Beverly Alfano of Drexel Hill, a member of St. Bernadette Parish, proclaimed a reading from the Word of God. During his homily, Father Groarke reminded the congregation that God will bless everyone in his own way. “I promise you that God will bless you in whatever way he wants you to be blessed,” said Father. During Communion, the hymn “Lord I Need You” was sung. Afterwards, Father Groarke told the people that their lives must be conformed to God as they go through life. Following Mass, the monstrance was again placed on the altar and it was time for people to be prayed over and healed. Everyone had the opportunity to be anointed individually and they showed a wide range of emotions. Some wept, others smiled while some simply prayed before the Blessed Sacrament as music played in the background. In one way or another, everyone was moved by the power of the Holy Spirit. Lisa LoMonico of West Chester and a member of St. Agnes Parish has had many opportunities to attend charismatic and healing services. This time she was able to bring her children. “I wanted to bring my kids to the healing Mass,” she said. Julianna LoMonico, 18, has just completed her first year at Delaware County Community College and this was her first time at a healing Mass. For those new to the area, the Mass was a way to get to know people in the nearby communities. Doris Cooper recently moved to Glen Mills from Wilmington, Delaware. She came to pray for a sick relative and this was the first time she had come to a charismatic celebration in a long while. It was a family affair for Father Groarke as his cousin, Mary Graham, and her son Bobby, both of Annunciation B.V.M. Parish in Havertown, came out to participate. In addition to Delaware County, the other four counties in the archdiocese (Philadelphia, Bucks, Chester and Montgomery) have prayer communities as well with opportunities to praise and worship God and to be healed.